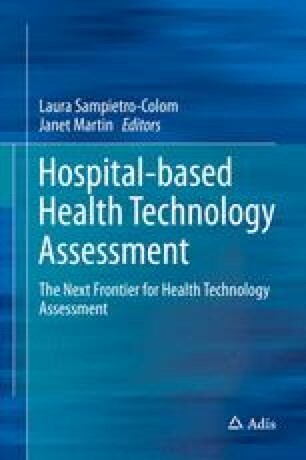 This book represents the first attempt to provide a collated description of the global experience in hospital-based HTA across 18 countries and 6 continents. It is clear that there is an emerging global movement afoot to increase HTA activity at the local level in order to ensure that hospitals’ decision-making needs are addressed within required timelines and that relevant institutional considerations and other contextual issues are adequately addressed. Despite the growth of government-related and other external HTA agencies in recent decades, the persistent gap between production of arms-length HTA reports and relevance and timeliness for decision-makers in the real-world hospital setting has become increasingly clear. HB-HTA has been proposed as a solution to bridge this disconnection since local HTA can specifically address issues of relevance, context, and institutional decision-maker timelines. Furthermore, HB-HTA can serve as an ally for national/regional agencies in transferring nationally produced HTA information and guidance to the real-world setting, through proper adaptation to local context characteristics. For this reason, we have entitled the book The Next Frontier for HTA, insofar as HB-HTA represents the natural progression from arms-length HTA, to a locally integrated relevant HTA, which spans decision-makers and the knowledge translation context to improve HTA reach and overall impact.